We are very excited about our much anticipated release of the 2018 Kalleske Plenarius Viognier. In 2018, ‘The Fruitful Pursuit’, compiled Australia’s largest-ever showcase of orange, amber and skin-contact white wines. The collection was opened during an interactive, two-day tasting event in Adelaide known as ‘Not Quite White’. From all over Australia, 46 of the best wines of this genre were invited to enter. The wines were judged by 266 consumer voters to determine the best, yummiest, most likable ‘Not Quite White’ there is… and we were humbled when the voters awarded our Kalleske Plenarius Viognier 1st place!! 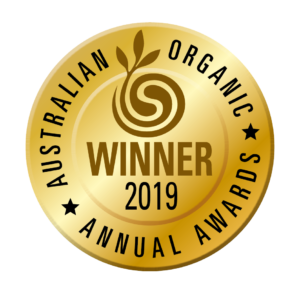 Winning the top orange/amber/skin contact wine award was a great thrill and very fitting considering we were one of the first producers to make this style in Australia. This new 2018 release of Plenarius is again made in the same way as previous vintages. 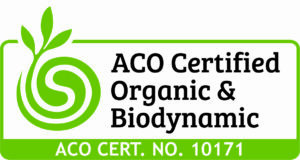 Certified organic and biodynamic Viognier grapes destemmed to an open top fermenter – skins, seeds and juice together. Wild yeast fermentation with hand-pumpovers, treated like a red wine. Then after 8 days on skins filled to barrel for 10 months maturation prior to bottling with absolutely no additions, 100% grapes in the bottle. 2018 Plenarius is an attractive light amber colour with a golden tint. The aromatics are lively. Very extroverted, it is bursting forth with honey, lemon, flowers, spice and fresh hops. The palate is engaging with initial flavours of marmalade and gingerbread. It then evolves into fresh cut red apple with some tart natural acidity providing freshness. Emerging next is a rounded texture, almost waxy mouthfeel followed by some light phenolic grip. The long finish neatly winds all the previous components together to give an evocative complexity to a captivating and satisfying wine. deserves to be “centre stage”. A BRILLIANT PALATE CHALLENGER. “It spends a mere seven days on skins, which seems long for a white wine but short in the current oeuvre of skin contact fermented orange wines in Australia. It’s viognier from the Barossa Valley. After its skin contact it hangs out in oak for ten months. Sent to bottle unfined, unfiltered, no sulphur. At $26 RRP I will go out of my usual silence on ‘value’ and say this is exceptional buying for complexity and interest. Deep, bronzed orange colour. Surprising considering the relative short-ish skin contact time. Heady scents of apricot, farmhouse cider, ginger, preserved lemon, honey, mead herbs. It’s compelling from first sniff. Close your eyes and you’re drinking a tannic light red. Firm chalky pucker defines the wine, but there’s rich apple, honey, ginger and peppery things all going on. Intense, structured, very, very long in flavour, and, to cap it all off, insanely refreshing. A stonkingly good wine”.